Funny photo of socialmedia, facebook and birthday. Funny photo about socialmedia, facebook & birthday. 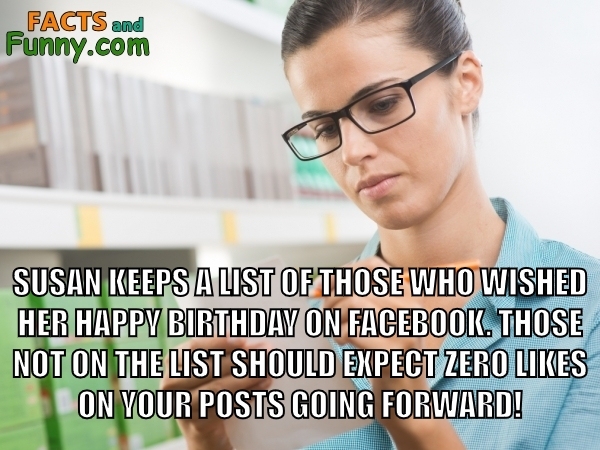 Susan keeps a list of those who wished her Happy Birthday on Facebook. Those not on the list should expect zero likes on your posts going forward! We find this joke funny because every birthday we notice one or two people who don't wish us happy birthday on Facebook, and it will not be forgotten!. In addition to socialmedia, this photo shows a woman, glasses and books. Bonus fact: more people celebrate their birthdays in August than any other month. This content was created in January 2019.